“Hello, I was just wondering, how can I get a horse to stand while I’m trying to mount? There’s this horse who is being newly trained and he hates to stand still for you while you’re trying to mount, although once you’re on he’s fine. Help?! Thanks.”-Ann M.
When I was growing up, if a horse didn’t stand still for mounting there was very little that I could do about it. Someone might offer to stand at the horses head and hold him still…but otherwise, I had no cue for the horse to stand still. The last ten words of the sentence above is both the problem and the solution. The problem is that people often have no effective ‘cue’ for telling the horse to stand still. Hoping they stand is not a cue. 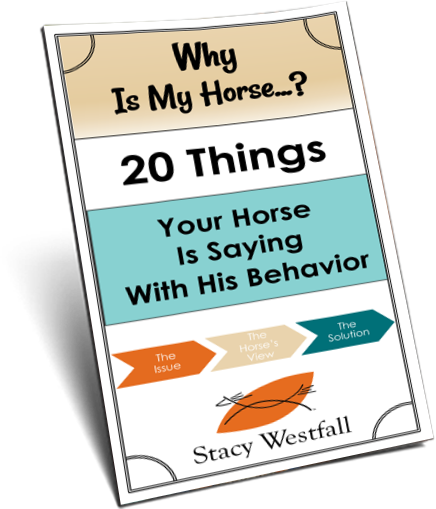 The solution is to train the horse to stand still using a cue that you can also reinforce. 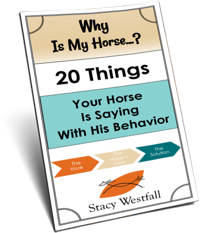 I teach my horse that when I bend his head around toward the stirrup, I will keep holding his head bent until he stops moving his feet. When his feet stop moving, l release his head. The release is the reward and horses figure out that if they want to have their head released their feet should stop moving. They figure this out quickly which means that it is an easy concept for them and it is very effective. Check out the following episodes from the Stacy’s Video Diary: Jac series. They show and explain how I teach the ‘stand still’ cue. This first short video explains the concept and shows both examples of what I expect in the beginning of training as well as in the end. The full video showing how I train horses to have a ‘parking brake’ is below this video, Episode 16. In the video below I demonstrate and explain the bending to stand still exercise at about one minute into the video and again just before seven minutes in the video. This way you can see Jac, the horse, bending when he is ‘fresh’ and again after he has been worked. ← Video: Horse that falls down to avoid being ridden.